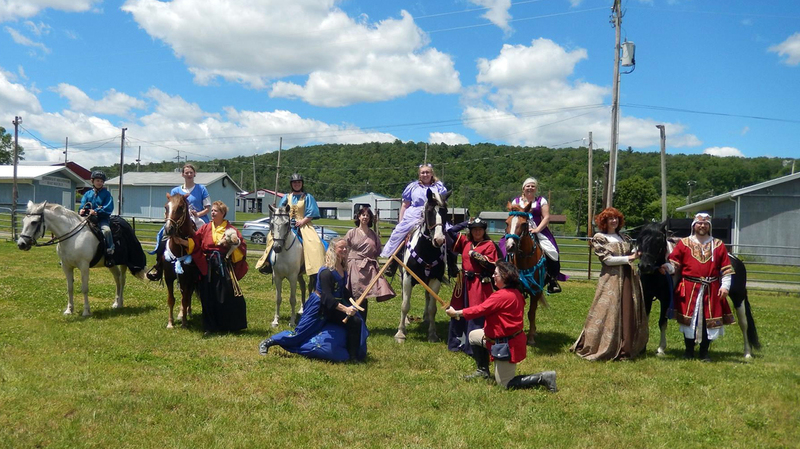 Sunny skies, balmy weather and a huge arena made for a wonderful day for the Æthelmearc Kingdom Equestrian Championships, held at Melee Madness in Endless Hills on June 3. Lady Gesa von Wellenstein on Freya. Photo by Jinx. Outgoing King’s Champion and Kingdom Equestrian Officer, THL Aaliz de Gant, ran a fierce competition for the riders, including the new Ride Before a Prince portion. 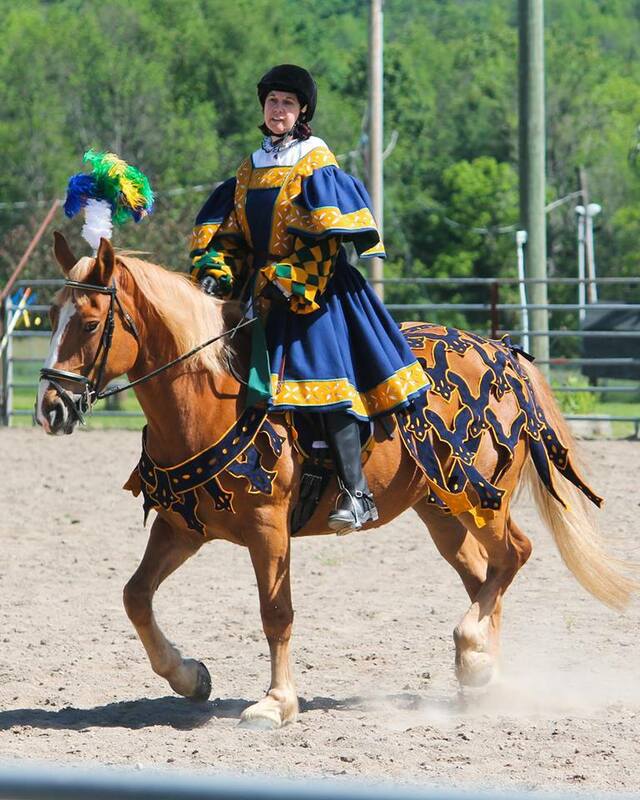 To Ride Before a Prince, which debuted as a War Point at Gulf Wars this year, incorporates historic research into period riding techniques to put together a performance to show off both rider and horse to the best of their abilities. The name comes from Grisone and Markham, two of the late 16th century riding masters, who included in their riding manuals instructions on how to perform before a prince. Modern day dressage stems from this art form, which began to supersede jousts and melees during the 1500s. 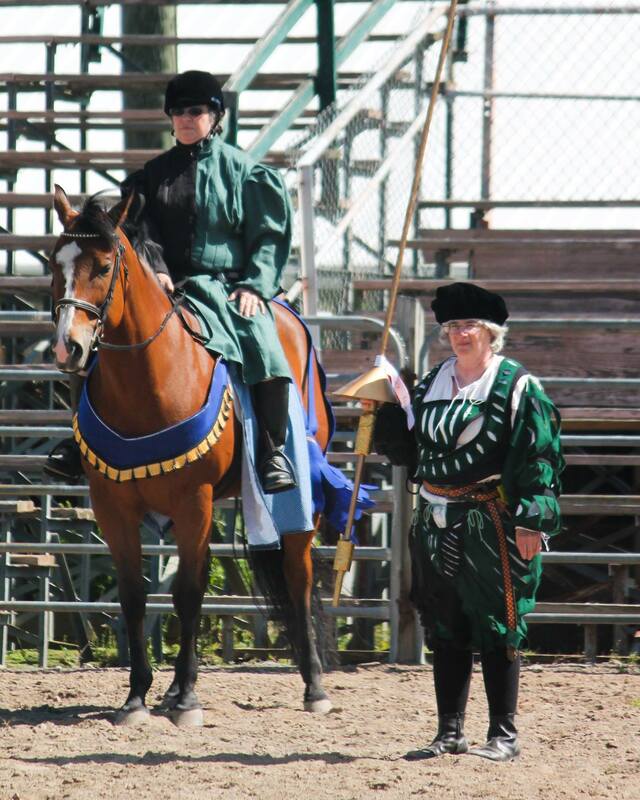 The driving force behind this new activity was THL Bridget Rede of Dunvegan, who was just given a writ of summons for a Laurel in Ansteorra for her historic equestrian research. Just as the fencing community is delving more into historic research and combat manuals, the equestrian community is starting to move beyond the normal “games” seen at most horse events. THL Maeve ni Siurtain on Lexi, and AE Head Groundsman THL Rhiannon Elandris of Glyndyfrdwy. Photo by Jinx. 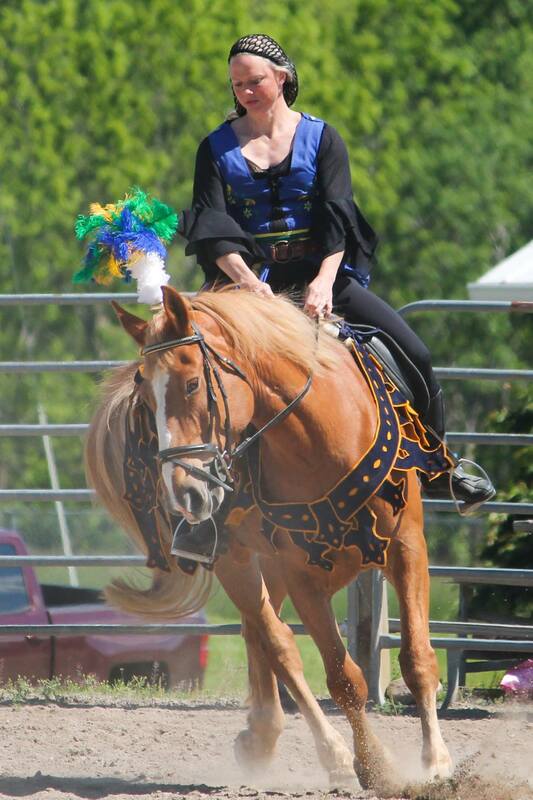 We had many new riders this year from Endless Hills thanks to outreach by Master TTigernach mac Cathail and Lady Rhiannon le Meke from Endless Hills – the local group fielded six feisty Paso Fino horses, including the stallion ridden by Master Tigernach. The first part of the competition was the Ride Before a Prince. The rides were performed to period music. and emphasis was placed on pageantry and the comportment and unity of horse and rider. The second half of the competition was a traditional games course with reeds, Saracen heads, quintain, a “water” hazard, and several maneuvers to show command of the horse, such as turn on the haunches and backing through an obstacle. Scores were tallied and the new King’s and Queen’s Champions were announced in court, much to the surprise of Mistress Ysabeau Tiercelin, who was named King’s Champion. Her score of 142 bested Master Tigernach in a close race with his score of 132.75, and he was named Queen’s Champion. Mistress Tiercelin on Freya. Photo by Jinx. The Champions serve the Kingdom through two reigns due to weather constraints in our Kingdom. Everyone is looking forward to next year!